I keep a spiral binder that I use to make notes to myself about things I need to do or information I need to keep at my fingertips. It contains my to do lists, packing lists, notes about hotel reservations and car reservations, and more. Today, I opened it up to make a packing list for my visit to Iowa this weekend, and I happened upon a list I apparently wrote back on August 18. I say apparently because I have zero recollection of writing this particular list. It’s my book and my handwriting, so I know I wrote it. But I don’t remember it. I am thinking this was something I did in the middle of the night when I couldn’t sleep. Four items on the list have to do with writing, two have to do with financial security, one with health, one with a home and one with love. It’s a short list, but it’s packed and specific. I don’t want love; I want the committed love of a good person. I don’t want wealth; I want wealth beyond worry. I don’t want health; I want continued fitness and health. I love this list. I love that I wrote it. I love that I wrote it just days before I went to Portland for the first time since my heart was broken. I love that I want big things. And I love that I wrote the list in the spiral that stores my to do lists. This isn’t some fantasy list written in my journal. This list lives in the book that I live and die by every day. If it’s in this spiral, I get it done. Finding this list today makes me happy. I’m patting myself on the back for being able to dream big despite my sadness at the time. And I’m patting myself on the back for the steps I’ve taken since then towards a number of the items on this list. I’ve written and been paid for an article. I’ve grown my writing business. I’ve made progress on my essays. I’ve signed up for another week of writing on Whidbey Island. I’ve lost weight and improved my physical performance in races. I’ve started saving again after paying for my upcoming trip to Africa. And I’ve met someone I think is a really good person. Go me. The only thing better than dreaming big is doing big. And I aim to do big. I have to. It’s in my “to do” book! 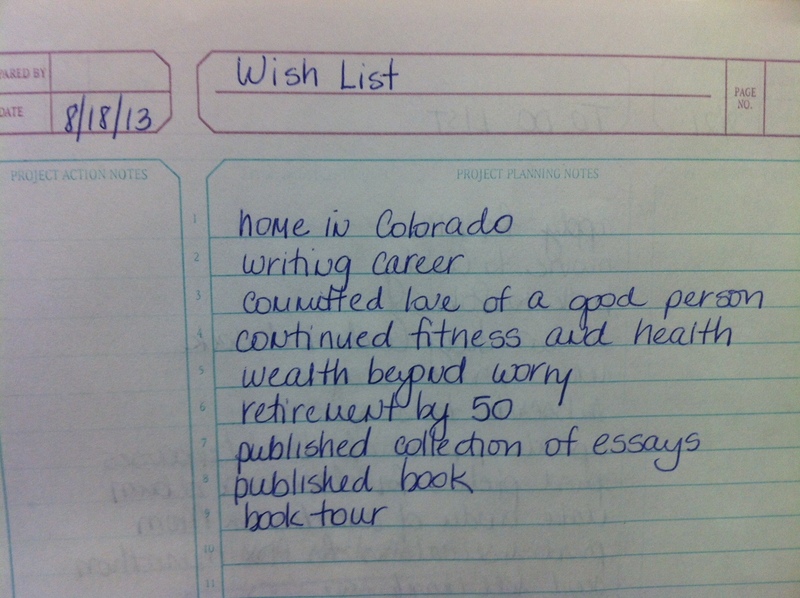 This entry was posted in goal-setting, Hope, Lists, Progress, Writing. Bookmark the permalink. ← Wednesday List #29 – Things I Learned Trail Running at Night. OH, how much I love this!! And how much it tempts me to make a similar list (which, interesting enough, would be quite similar to your list!). “Wealth beyond worry,” indeed. In financial, and so many other, ways. If you write a list, I would love to see it! I hadn’t thought of wealth beyond worry as anything but financial, but you’re absolutely right that it could be. I like your reading of it!